The entire plants of Taraxacum mongolicum Hand. Mazz., T. sinicum Kitag. or other sibling plants of family Compositae. Dug it between summer and autumn at the beginning of blossom. 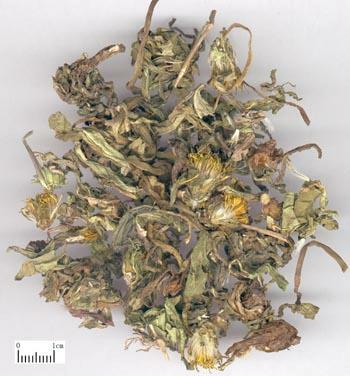 Leafiness, grayish green, complete root, and yellow flower without impurities. Used in fresh or unprocessed. Bitter, sweet, cold; liver, stomach and lung meridians entered. Clear heat and remove toxicity, clear heat from liver, stomach and lung, clear heat and remove dampness. It has a stronger action of clearing heat and removing toxicity, and a flavor of sweet and bitter which are scarcely harmful to stomach. All sores and abscess no matter interior abscess or exterior abscess, caused by excessive heat-toxicity can be treated with this herb. Because it excels in clearing heat-toxicity from liver and stomach meridians, and can relieve depression and promote lactation, it is regarded as an essential herb for treating mammary abscess caused by heat-toxicity accumulation in liver and stomach. It can be decocted singly and taken orally with its thick decoction, or its pounded juice of fresh products can be taken and with the dregs applied simultaneously. For clearing heat and removing toxicity, curing abscess and dissipating nodulation, it can be combined with Gua Lou, Jin Yin Hua, Niu Bang Zi and Xuan Shen to improve the effects. For example, it is combined with Ren Dong Teng in Ben Cao Yan Yi Bu Yi ( Supplement to Augmented Materia Medica); and with Hong Hua and Xuan Shen, as in Ru Pi Xiao Pian from Pharmacopoeia of the People's Republic of China published in 1995. For dermal sores, abscess, deep-rooted boils and furuncles with swollen pain. It is often combined with toxicity-removing and abscess-curing herbs, such as Ye Ju Hua, Zi Hua Di Ding and Jin Yin Hua, etc. , as in Wu Wei Xiao Du Yin from Yi Zong Jin Jian. For abscess with intestinal abscess with abdominal pain, it is often combined with Da Huang, Mu Dan Pi and Tao Ren which are herbs for removing toxicity, cooling blood, activating blood and dissipating nodulation. For pulmonary abscess with purulent vomiting, it is often combined with heat-clearing and toxicity-removing, abscess-curing and pus-discharging herbs, such as Yu Xing Cao, Jie Geng and Lu Gen, etc. Furthermore, the fresh products can be applied topically to treat venomous snake bite. B. Swollen and sore throat, swelling and pain of gum, red eyes with swelling and pain. It can clear both fire-heat and heat-toxicity from lung, stomach and liver meridians, so it is commonly used in treating swollen-sore throat and gum, and red eyes with swollen pain which are caused by either up-flaming of fire-heat or heat-toxicity. For swollen and sore throat, it can be combined with herbs excels in clearing lung heat and removing toxicity such as She Gan, Ma Bo and Ban Lan Gen, etc. For swollen pain of gum, it is often combined with Huang Lian and Sheng Ma which are herbs for clearing stomach heat and removing toxicity. For red eyes with swollen pain, it can be pounded and dropped in eye with its juice or taken orally with its thick decoction, and can also be combined with liver-clearing and vision-improving herbs, such as Ju Hua and Xia Ku Cao, etc. It also has the action of removing damp-heat and inducing diuresis and relieving stranguria, and has a better curative effect to treat all kinds of damp-heat syndromes. For stranguria syndrome due to damp-heat, it is often combined with diuresis-inducing and stranguria-relieving herbs, such as Bai Mao Gen, Jin Qian Cao and Che Qian Zi, etc. For jaundice due to damp-heat, it is often combined with dampness-excreting and anti-icteric herbs, for example, Yin Chen, Zhi Zi and Da Huang. For diarrhea and dysentery due to damp-heat, it is usually combined with heat-clearing and damp-drying herbs. Huang Lian and Huang Bai are the examples. Decoct 10~30g; double dosage when fresh products are used. Proper dosage of fresh products are pounded for topical applying, or decocted for fuming and washing.